NIU student Angela Burke hails from blue-collar Burbank, Ill.
With its prevalence of mom-and-pop restaurants and the regular roar of low-flying passenger jets from Chicago’s Midway Airport nearby, the southwest suburb certainly seems more city. So, for a week in August, it must have seemed to Burke like she was on another planet – or perhaps living in a time warp – as she stepped out each morning onto the front porch of a little yellow farmhouse, a cup of coffee in hand. A symphony of songbirds. A pink-haloed sunrise. A misty, endless prairie of tall grass, dotted with sunflowers, forbs and coneflowers in shades of pink, purple and yellow. Welcome to the gloaming hours of dawn at Nachusa Grasslands preserve, near Dixon, Ill., just a 45-minute drive from the Northern Illinois University campus. It provides a stunning reminder of what the “Prairie State” looked like once upon a time. Burke, along with a host of other NIU student and faculty researchers, couldn’t be more excited about a new remnant of prairies past that was recently added to the Nachusa Grasslands scenery: the magnificent bison, the largest mammal on the North American continent. Quick note on bison vs. buffalo: Both are acceptable terms for the layman – after all, the legendary showman wasn’t dubbed Bison Bill. But the two main buffalo species actually reside in Africa and Asia. Bison is the correct scientific term for the North American species, which was last known to roam Illinois in the early 1800s. Owned and operated by The Nature Conservancy, a nonprofit conservation organization, Nachusa Grasslands demonstrates how prairies can make a comeback. World-renowned for its restoration strategies, the preserve’s 3,500 acres also have become a living laboratory for NIU scientists and students. And research efforts are ramping up with the reintroduction of the shaggy behemoths of the Great Plains, which once numbered in the tens of millions nationwide before becoming nearly extinct. 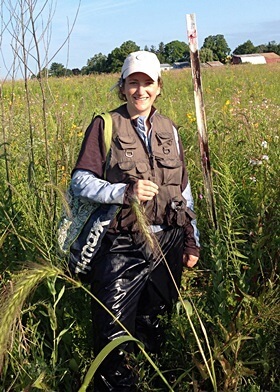 NIU Professor Holly Jones in one of her laboratory’s study plots at Nachusa Grasslands. In early October, Nachusa welcomed 20 new bison from a genetic line saved by President Theodore Roosevelt in 1905, creating the first wild herd east of the Mississippi River. The hope is to grow the herd to 100 animals. Jones’ NIU laboratory is beginning studies on how the bison’s presence will effect populations of grassland birds, small mammals and deer. She has six students working on projects, including Burke, who this past August trapped and tagged voles, ground squirrels and several varieties of mice. Burke is returning for additional trappings this month and other times over the course of the school year. “I took one of Dr. Jones’ classes as a student-at-large, and she was truly an inspiring teacher,” Burke says. 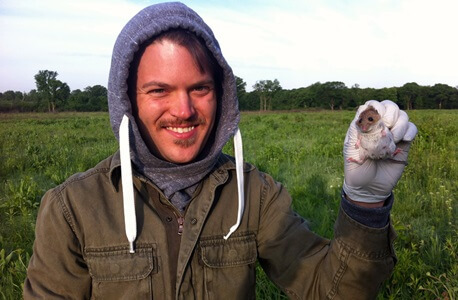 “It led to me taking on her small-mammal project. as part of an Undergraduate Research Apprenticeship. Meanwhile, other NIU professors are lending their research expertise to Nachusa and using the prairie to create hands-on learning experiences for scores of students. Kleiman said three state universities and several from outside Illinois are involved in research at the preserve. Those NIU scientists include Melissa Lenczewski (water quality) in geology; David Goldblum (biodiversity), Lesley Rigg (vegetation dynamics) and Michael Konen (soil) in geography; and Richard King (reptiles), Wesley Swingley (soil microbiota) and Nicholas Barber (insects) in biological sciences. Not only will society benefit from the work, but so do students who gain opportunities to learn alongside experts in the field. 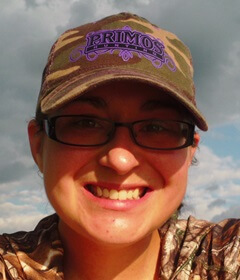 “I’ve gained experience by learning how to collect samples and working with professors and other students, and I’m also gaining a better understanding of the prairie itself,” says Rachel Farrell of DeKalb. The 40-year-old, non-traditional student is a senior Environmental Studies major. 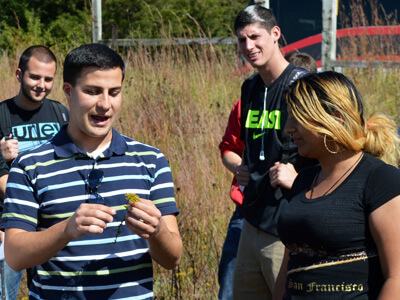 Professor Nicholas Barber (left) leads a field trip to Nachusa Grasslands. Farrell received an Undergraduate Research Assistantship to work with Professor Goldblum and has been visiting the grasslands regularly since May, monitoring soil respiration. 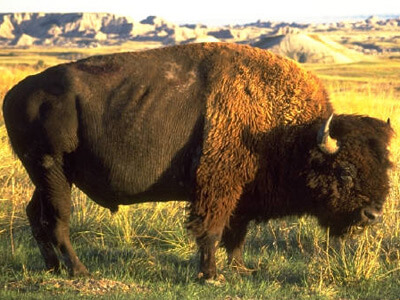 She’s eager to see the benefits that will be derived from the addition of bison. While many students work one-on-one with NIU scientists, entire classes also visit the Nachusa Grasslands for engaged-learning experiences. Professor Barber took two ecology classes to the preserve earlier this semester. “It’s an invaluable resource for field trips, to be able to let students experience a high quality prairie ecosystem like this,” says Barber, whose laboratory has been conducting research at Nachusa for the past three years.